ISATOU NJIE-SAIDY, Vice-President and Minister for Women’s Affairs of Gambia, said the paralysis displayed by common security mechanism was astounding. Geopolitical interests had trampled the goodwill and humanitarian concerns that should compel all to address these raging infernos — be it in the Middle East, Asia or Africa. The relevance of the United Nations had at times been questioned but one element that remained unchallenged was its character of being the best forum for confronting global challenges. When it came to the issues of climate change, economic crises, financial turmoil, food insecurity, conflicts, fighting disease, poverty or the special interests of Africa, the convening power of the United Nations conferred legitimacy unparalleled elsewhere. She said the scorecard on the Millennium Development Goals showed that, while some achievements had been made in some Goals, a lot still remained to be achieved. Her country had met some of the key elements of the Goals and was on track to meet all of them. In view of the fact that 2015 was just around the corner, there was a need to do more to mobilize the remaining resources that would further improve the critical link between success and failure on the achievement of Millennium Development Goals. Critical to such achievement would be the scaling up of resources by enhancing the global partnerships. Recalling that Rio+20 had defined the mechanisms through which the Sustainable Development Goals should be negotiated and agreed on, she said it was Gambia’s hope that the consultations on the post-Rio mechanisms would be inclusive, transparent and representative. For developing countries to continue to benefit from the appreciable growth they were experiencing and in order not to compromise their capacities to bring education and health care to their peoples, debt cancellation or forgiveness was still a major option. Debt serving still posed a major threat to the ability of developing countries to attain sustainable growth. Their partners and the Bretton Woods institutions should consider the extension of the Heavily Indebted Poor Countries (HIPC) Debt Initiative further. On conflicts in Africa, she said the international community would pay a very steep price if it did not wake up from its slumber and resolve the situations in Mali and Guinea-Bissau. ECOWAS should not be left alone to shoulder the burden. The Security Council must act with a great sense of urgency. 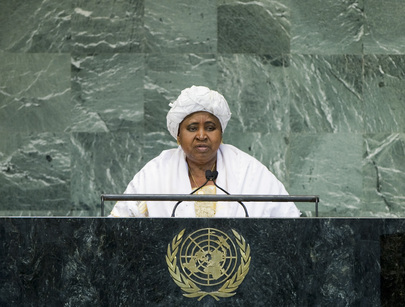 “ Gambia stands ready to contribute meaningfully to the settlement of these conflicts,” she said. The level of steadfastness shown in solving the conflicts in Liberia and Sierra Leone must equally be shown in Mali and Guinea-Bissau. The situation in Darfur continued to occupy the attention of her delegation. She called for more dialogue in finding a lasting solution to this conflict, and expressed equal concern about the lingering conflict between Sudan and South Sudan. She went on to appeal to the collective membership of the Organization, including China, to contribute to opening the avenues for Taiwan’s membership in various funds, agencies, treaty bodies and programmes. This would only enhance the effectiveness of these bodies for mutual benefit. Taiwan was a key player in international trade and politics. Also, the stalled reform of the Security Council “was disheartening”, she said. Year in and year out Member States came and made proposals and then they did not get anywhere. Kofi Annan had said at the time of launching his report “In Larger Freedom – Towards Development, Security and Human Rights for All” that no reform of the United Nations was complete without reform of the Security Council. “We cannot afford to be in a state of coma when larger regional interests, especially those of Africa get shunted around or jettisoned,” she said. Africa needed to be at the table and it would not budge on that demand. Africa must be legitimately represented on the Security Council. Recognizing the appointment of Jan Eliasson as the new Deputy Secretary-General of the United Nations, she expressed confidence in his abilities and experience as an astute statesman and acknowledged his keen interest in and engagement with Africa.